Themed "Water for all - Leaving no one behind," this year's World Water Day targets propaganda and mobilization to create opportunities and improve social groups' access to clean water. Access to hygienic and safe water is a foundation for community health, which is very important to the sustainable development of every nation. The United Nations Sustainable Development Goal 6 (SDG6) targets universal access to safe and affordable drinking water for all; elimination of rudimentary toilets; special attention to the needs of women, girls, and other vulnerable people; improvement of water quality by reducing pollution, minimizing the discharge of dangerous chemicals and materials into water sources, and halving untreated wastewater; increase of water use efficiency in all fields; assurance of sustainable exploitation and use of fresh water to solve water scarcity; significant reduction of the number of people deprived of water; etc. by 2030. Ngo Thi Thao, Head of the Division of Water Resources (Department of Natural Resources and Environment), said the specific objectives of World Water Day 2019 include water for women; water for workplaces and production; water for rural areas; water for mothers, children, students; etc. Despite those goals, in fact, billions of people around the world have not been able to access safe water sources, including families, schools, workplaces, farms, and factories. As assessed by experts, no access to safe water sources can adversely affect vulnerable community groups like women, children, people with disabilities, etc. This year's World Water Day is geared to solving the water crisis by addressing the reasons why many people are left behind in the process of accessing safe water sources. Over the past years, Hai Duong has been one of a few localities achieving positive results in providing people with clean and safe water. By the end of 2018, 221 out 227 communes (97.4%) in the province had been supplied with clean water meeting Standard 02/2009/BYT. 78 concentrated clean water supply works have been built in the province, including 73 active ones with a total designed capacity of 120,000 m3/ day. Of these, there are 70 works using surface water and three using groundwater. The water supply works were built in sync, expanding water supply in an inter-commune direction. All of the active works provide standard clean water, ensure water capacity, pressure, and flow, and meet the use demand of rural residents. 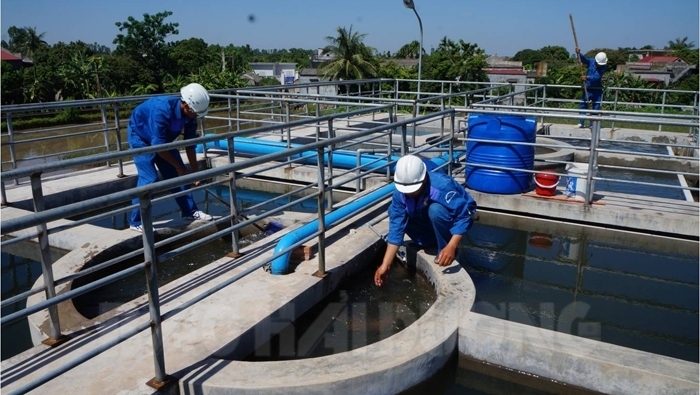 According to the Monitoring and Evaluation Toolkit for Clean Water and Environmental Hygiene in Hai Duong Province's Rural Areas, by the end of 2018, all rural inhabitants and poor people had accessed hygienic water, 94.1% of rural people had used clean water meeting the National Technical Standards, 99.58% of rural households had had toilets, 98.25% of rural households had had hygienic toilets, 93.53% of poor households had had hygienic toilets, all schools and commune medical stations had had hygienic water and toilets, the percentage of households having hygienic cattle sheds had reached 86.8%, and all concentrated water supply works had operated sustainably. Thanks to efforts of authorities at all levels and responses of businesses, Hai Duong rural clean water supply network has incessantly been expanded with more and more people using clean water and people's lives increasingly improved. Hai Duong is striving for all rural residents to have accessed standard clean water by 2020.